enamel onto the copper around the bronze! I figured it should work, and I’m happy to finally confirm for myself that it does. So the big question now is: when can I find time to make another batch of bronze pieces so I’ll have more “scraps” to play with! And I ask myself, what was I waiting for?!! 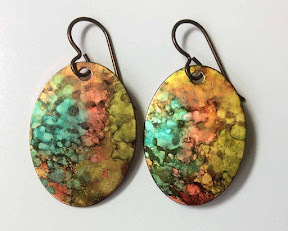 I’ve wanted to do this with bronze and copper since I first started using bronze clays! When did Hadar release her first “Quick Fire” bronze? 2010? If that’s right, since then! But I waited what seems forever before taking even the next step (though, to be fair, I was playing around with a lot of other ideas in the meantime). I remember how it felt the obvious thing to do when cutting clays with one of my Silhouette cutters (in this case, my Portrait). Though I’d had that thought for a while, I remember firing that particular “drop” of cut-out clay onto a copper oval during my initial trials of “one fire brilliant bronze.” (That was the last of Hadar’s “one fire” clays that I tried, and I struggled with it a bit through several rounds of testing … but it is now a favorite when I want to work in bronze!) 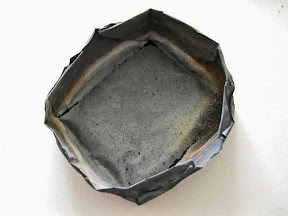 I came across the “blank” last week as I was firing a few steel pieces with enamel: it was the last piece I fired before cleaning everything up so I could use that work-table for an Open House this weekend. O, yes, that’s why I waited! 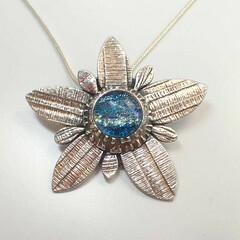 On top of that, even the test-piece shown here has a simple “separation enamel” flower on its other side! Simple in case this side should have failed for some reason, but there because …. that’s just what I try to do! Are you drawn more to minimalist or complex designs? (Not just mine: anyone’s!?) Leave a comment! 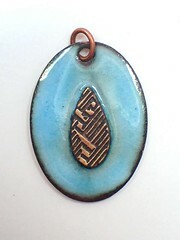 Several years ago, I made a small series of “doorway” pendants. I have no clue why I don’t seem to have stopped to photograph and write about them: I must have been busy with something else at the same time and devoted my social media time to that instead. Digging back through photos now, the only one I can find is a rather blurry snapshot of the last one from that series. But the funny thing is how that piece, Ancient Doorway, is the basis for this post! Ancient Doorway had been bought by one of my regular customers. She comes by at least once a year, usually with her mother and/or occasionally with a sister, often with children and/or spouses in tow too, and they entertain me for a while as they explore my offerings, provide interesting critiques, and debate which to buy for themselves or each other. They are very enthusiastic, and thus a lot fun to have as customers. And I remember the time she bought that piece because, as she walked in the door her eyes landed on that one first and sparkled! She headed straight to it, picked it up, turned it over, checked the price, set it back down, looked at several other pendants, came back to it and made a few comments, looked around some more, returned to it again and held it up in front of a mirror, looked at some earrings, and finally declared something to the effect that it was definitely her favorite of all the new pieces I had that day. The funny thing about that is this: I knew from the moment she first headed for it that it was the last piece left from that older series, adapted from a project in one of Hadar Jacobson’s great books (and being the last one is probably why I got at least a quick shot of it). And she had to have been shopping at least two previous times when it was there. So I stood there trying to remember if she’d expressed interest in it earlier, and didn’t think she had. But she was definitely intrigued that day. I was happy to have the sale, but I was also very happy that it made her happy even if that had taken a while. Except when she came in earlier this summer, she was sad. I could have a few of the details wrong here, but I remember her saying that she usually doesn’t take jewelry with her when she goes on vacation with her family, but she liked that one so much she wanted to have it with her when they took the kids to DisneyWorld. She clearly remembered seeing it on the bathroom counter the last morning when she went to take a shower, but realized on the trip home that she wasn’t wearing it, and didn’t remember putting it back on as they rushed to get everyone out the door that morning. As soon as possible, they called the hotel to ask if it had been found, and were told no. She was disappointed in herself for having lost it: could I make another one? Of course I said, “Of course. Yes!” I did add that I’d never be able to recreate it exactly, but was it OK if I made something similar. Sure. I said that I was in the middle of some other projects, so it wouldn’t be right away. Was that OK, or did she want it asap? She said that as long as she knew it’d be coming, that was fine. I said that what I’d do would be to make several, give her first choice, and then just put the rest up for sale to others. She liked that idea. starting at the front and working backwards. The techniques to make it work are a bit different and, in some ways, I now think that “easiness” may be a toss-up. It is far easier to control the design with the approach I used with the former (Through the Arches), but far easier to get great, smooth side-edges using the techniques I applied to the latter (Into the Vault). So I guess I’ll just have to make a couple more! Just as I finished those two, I looked at my calendar and realized that I needed several entries for two upcoming art shows, so each of the new doorways went to one of those! Through the Arches (left) will be on display (and available for purchase) at the North Hills Art Center in Ross Twp, PA, from September 8 through October 5, (along with a second piece, a quilt-design piece with a cubic zirconia). Into the Vault (right) will be on display (and available for purchase) at the Arts on the Riverwalk art competition, sponsored by the Hoyt Art Center at the Confluence Cafe in New Castle, PA, from September 8 through November 1 (along with a second piece, a shamrock design that incorporates dichroic glass). has earned a Merit Award … and was the only 3-D piece to win an award! You may notice that both of those shows open on September 8. In order to get to both of them (and accept the award in New Castle), I’m moving my usually-Second and usually-Saturday Studio Session & Open House one week later, to September 15. I hope I’ll see some familiar faces at the shows this weekend, and in my studio next weekend … though of course I also look forward to meeting new folks too! Whenever I walked into my studio last week, I passed lots of red and green Christmas decorations throughout the building. As I sat down with some silver clay and a small box of dichroic glass cabs, I think that decor is what lead me to be drawn to several green pieces. With over half of my studio turned into a show-room, and only one “holiday” show left after I’d have time to fire and finish anything I made between visitors, I had to work simple. But then my maker’s-sales brain kicked in and I picked up those green cabs and used them in … shamrocks! 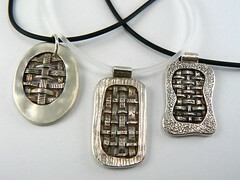 Three fine silver pendants for spring. 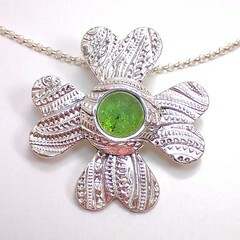 And the “lucky” four-leaf one, with a “spring green” piece of glass, has already been purchased! Knowing that it will age slowly over time, the customer wanted it like this, without any patina. I managed to grab this quick photograph while the buyer selected a chain to go with it. The photo shows a sterling rolo chain though it went out the door on (what I do agree was a better choice for this particular texture) a foxtail style chain. For those interested in technical details, all three of these were made with PMC Plus and PMC Flex. Why those clays? I’d taught a lentil-bead class last week in which we used Plus, and I had a lot left from a big packet I’d opened there, so I used that for the backing pieces, the leaves, and the bails. To be sure those were fully sintered, that much was fired at full time & temperature: nominally, that’s 1650°F for two hours. (I say nominally because, since my kiln fires about 50° hot, I set it to 1600 … which means it should have fired at about 1650… And I did hold it for two hours.) That gives all the “structural” elements the maximum strength possible for that particular silver formula, even though it would have been way too hot for the glass. The next day I made the “bezel” elements to surround each glass piece and hold those in place from the top. I used PMC Flex for that. I could’ve used PMC3 or Art Clay 650 or any of the “low-fire” fine silver formulas but, again, the Flex is what I had handy, so that’s what I used. The point here is that I needed a clay that would reliably sinter at a low-enough temperature that I could fire the glass in place! Clay fired down at “glass” temperatures might not be quite strong enough for the leaves (that hang off to the side) or the bail in back (from which the piece is hung when worn), but with a good, strong backing, the use of a lower sintering temperature should be fine for just holding the glass onto strong backing pieces. I used a four-segment program that experience has shown to provide good strength to the silver bezel while keeping the glass happy. I did choose to add a patina as I finished polishing these two after their second firing. 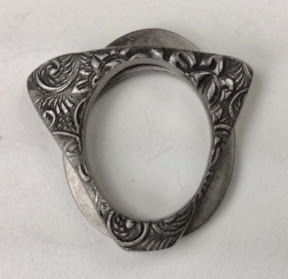 And, if you’re interested in a few notes I wrote about using a mix of sterling and fine silvers in this sort of design, feel free to check out my post from October of last year. Even though these designs reflect the shape of shamrock (young clover) leaves, because of the textures I used and the glass centers, I’m calling them part of my Urban Flowers series. I never claimed that my urban flowers were going to be biologically correct representations of particular species, more that the plants would serve as “inspiration” for those pieces. 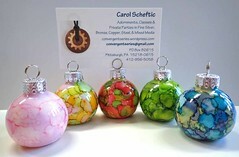 In some ways that concept also fits with the colored glass ornaments I make during the summer (when I can work outdoors). Those are designed with a double-loop on the top of the ornament and a flat bottom to the glass bases: they can hang on your Christmas tree if you want and then, for the rest of the year, you can set them on a table or desk and use them ho hold whatever kind of note or photograph or other reminder that you want! Similarly, I hope that these shamrock pendants fit both with the green fir / pine / spruce decorations during winter holidays, and can continue being worn to reflect the natural world as spring returns! Or maybe the heart-shaped leaves will even warm someone’s heart in time for Valentine’s Day?! Regardless of the “connection” made, I do hope the rest of these will soon find good, new homes! This post is going to jump into the middle of a story about several different things I’ve been working on: adding a little bit of color to my creations by incorporating some glass (especially dichroic glass) and working with sterling silver metal clays. Why start in the middle? Well, I really do miss writing about all the explorations I do in my studio. I haven’t been saying much about them lately because we still don’t have reliable internet access in the building … and I used to compose posts as I worked. You can probably imagine that, after a long day of working on explorations (and more), the last thing I want to do is go home and stay up for hours more writing from there. But it’s a gorgeous fall day and I suddenly decided to enjoy it by staying home this morning, sitting out on my back porch with a cup of tea, and writing about a piece I just finished on Friday. The second, or maybe it was the third, piece I ever made using metal clay incorporated a lovely, long, oval, pink glass bead, set with loops of syringe-clay to hold it in place. It was fun to do, but it took me a few more years before I got into adding glass on any sort of regular basis. About six or seven years ago, I went through a phase of using glass fairly often. Then I moved off in other directions, with what remained of my collection of glass pieces sitting in a corner of one of my stash-drawers. I’d acquire another bit of glass every now and then until, a few years later, I made a few more pieces using some of those, and taught it as the final project in a couple of private lessons and multi-session intensive workshops. Probably the main reason I didn’t keep pushing with glass is because I’d felt limited to using PMC3 or Art Clay 650: those were the only metal clays that could reliably be fired with glass. Now, those are both fine metal clays: I have been quite happy using either one of them. But glass just isn’t happy at the 1650°F (900°C) for two hours that all fine silver clays require for the strongest sintering, even with those formulas. Although they will technically sinter at lower temperatures and shorter times, they still don’t get as dense, and thus won’t get as strong, as they could do at 1650°F for two hours. They do come out perfectly acceptable, and I hope people will treat any piece with glass somewhat gently … but I just like going for the strongest pieces possible. Still, I do love glass. 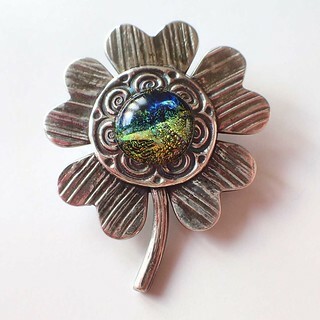 So this summer I made some more fine silver pieces with dichroic glass cabochons, called them class samples, and included that process in another four-day session I was scheduled to teach at The Artsmiths of Pittsburgh. The first photo with this post shows one of the sample pieces I made for that class. While a couple of my samples used the same PMC3 and Art Clay 650 that I’d used in the past (mostly to refresh my memory of how I’d done it) this one and several others used PMC Flex. Flex is similar to PMC3 but it has a slightly longer working time (good for workshop students not yet comfortable enough with metal clays to work really fast) and it remains a bit flexible when dried (which makes it very useful for anyone fashioning the parts that capture and hold the glass). And, though there’s still the problem of not sintering to the maximum density possible, it does sinter reasonably well at temperatures where glass remains happy. So, for fine silver with glass, it seemed a good choice. After I’d made those samples, on some of the hottest days this summer when I just didn’t feel like going out to work in my garden, I got to thinking about a possible new series of pieces, ones I’ve taken to calling my Urban Flowers. They are flower-like designs, but from my imagination. While they may be based on some actual flower varieties (and may or may not be named for their inspiration), I am not attempting to make biologically-accurate representations. They’re just a city-girl’s dreams. The textures come from urban life: wallpapers, flooring, construction debris, household objects, etc., and they feature glass (or, occasionally, something else that is commonly found in urban environments). I’d been happily exploring these designs, mostly using PMC Flex, while working on some other styles completely and, for those, using diy-960 clays (i.e., mixing PMC+, PMC3, PMC Flex, and/or Art Clay 650 with PMC Sterling clay). And then CoolTools released EZ960. OK, I didn’t really need it, as I’d been doing fine with my various diy-960 combos, but why not give it a try? Soon after, both PMC and Art Clay released their own silver-rich sterlings (PMC One-Fire Sterling, a .960 formula, and Art Clay 950, where the number designation has switched from a minimum Celsius firing temperature to a Fine Silver percentage). I got some of each of those and started testing them too. At some point, I hope to find a chance to write about all that testing. For now, though, let’s stick to the Urban Flowers story. While I do love the color of plain fine silver, I can also appreciate the gain in strength that it gets when a bit of copper is added to produce sterling silver. And, as noted above, I much prefer to produce pieces that are strong. The 950-960 formulas will be stronger than a 999 fine silver; they get you to almost as much strength as you can get in the great 900-925 alloys. Plus, they have the benefit that they are as easy to fire as the 999 clays (i.e., much easier than the 900-925 ones, where having more copper complicates the firing). So, yes, any 960 (diy or commercial product) will be a compromise, but still an excellent choice. With one exception: the 950-960 clays need temps and times higher than glass can take without just melting. 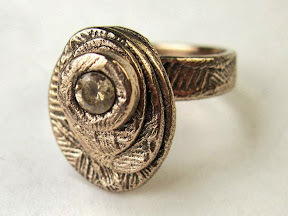 But, d’oh, why didn’t I think of this before (even with the .999 fine silver clays!)? I work with base metal clays, and I do some pottery, and we’re talking about multiple firings to get many of those to work. So here’s the inspiration I had, and the first (simple) piece I made to test it out…. I do still need to figure out a reasonable pricing schedule to accommodate the fact that I’m doing two firings, and that attaching the unfired clay to the fired metal can be a little trickier than attaching two unfired elements. Though that will add a small amount, in the grand scheme of things, it won’t be much. Once I’ve found time to make more to extend the series, and refined the process of doing it this way, I can see how the time works out and apply that even to my initial-trial pieces too. The only real problem with this approach is the way the two firings will affect trying to do this in a class … but it’s just another reason to offer multi-session workshops, rather than the quick one-shot ones, when including easy but still advanced topics. The evolution of two “old favorite” classes! It’s time to follow up on an earlier statement, and write a little bit about some upcoming classes. But since this is (what is often called in social media circles) Throwback Thursday, I thought I’d include a few notes on how the ideas and directions for two popular sessions have evolved over time, since I’m repeating them on a couple of Saturday afternoons this month (soon!) and next. I must admit that the idea for this came from Hadar Jacobson. I’ve made pieces, and then been asked to teach classes, using both precious metals (silver) and base metals (bronze, copper, steel). We texture the clay and then roll it thin in order to get it to drape nicely. With .999 fine silver, that produces pieces that seem to me to be a bit too fragile, risking bending or breaking at the thinnest points. We can solve that problem by adding a backing layer, or at least a frame, to provide additional stability. When we use base metals (like these in bronze and copper), we get pieces that are a bit harder. Thus, most of our pieces can just be folded and embellished. They rarely seem to require extra layers for sturdiness, though of course those can always be added if desired from a design standpoint. I will admit that I never tried making these with .925 sterling silver: I don’t particularly like fussing with the firing schedule for that clay, and have only used it for a handful of different designs. But last winter I started making these with .960 sterling which is much easier to fire than is the .925 form, and they turned out great. So that’s what we used the last time I offered this as a class, and it’s what we’ll be using again this week. At this point, we’ll still be using “homemade” .960, that will come from mixing .999 and .925 clays. There is a commercial version now available, EZ960, that’s recently been released. We won’t be using that here simply because I haven’t yet had enough time to experiment with that to feel as comfortable as I’d like using it in a class. I want to learn any and all potential pitfalls with it myself before foisting it on a room full of students! Stay tuned for news in that arena. The way I began to make these pieces, and lead students in making them, has had a number of inspirations. Hadar, again, was one of them, but so were CeCe Wire, a project in the RioRewards certification program, plus a whole range of others (such as some of Mary Hettmansperger’s metal-weaving projects). 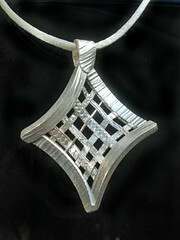 Sometimes, as in the silver pieces above, the weaving would be the main element in the design. Other times, as in the mixed-metals piece shown next, the woven portion is more of an accent to another important part of the design. Because of the thin nature of the strips used in the weaves, however, I always made sure that their ends were securely tucked into a frame. Ahh, but do you remember the .960 silver I just mentioned above? Yes! While I’ll still guide students through some dos and don’ts in letting small ends hang out, we can now be far more adventurous in allowing that. We no longer need to be completely constrained by framing. Again, we can use solid frames if we want that in our designs, but it’s now an option, not a requirement. This class is going to be another one that’s lots of fun! If you’re in the western PA area, or can get here for one or both of those dates, I hope you’ll join us! Please note: The links in the title of each session above take you to the site from which you can reserve a seat at that particular class. 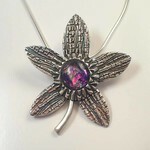 In each case, the materials provided will be enough to make an interesting pendant. If you want to divide it in half and make earrings instead, that’s fine with me. If you want to buy a bit more material and make something big or even (if you find yourself so comfortable with this material that you are able to work quickly enough to…) make both a pendant and a pair of earrings, that’s yet another option. Also: I’ve got two other workshops coming up this summer, both of which are multi-day events. I’m hoping to write about those soon too, but the ‘net access in my studio is getting increasingly less reliable (we’re hoping for a fix next month…), so I’m struggling to keep up with online announcements. But you should know that all my workshops at The Artsmiths of Pittsburgh are announced on the Eventbrite system. If you are interested in a specific class but for some reason can’t make it on the given date(s), please let me know. I’m happy to repeat any of my sessions on another date, whether it’s back at Artsmiths again, in my studio, or at another site. 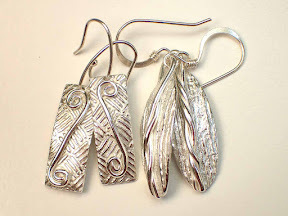 As promised in my last post, here’s the story behind the earrings whose photo I posted there…. 1. In my fairly early days working with metal clays—as soon as I’d moved on from just using a creme brulee torch and bought my first kiln but when I was still working on tray-tables in my family room, years before I started this blog or opened my studio—I found much inspiration in the work of CeCe Wire (one of the pioneers in metal clay techniques), and one of the things I had fun doing was making pieces that played with shrinkage. 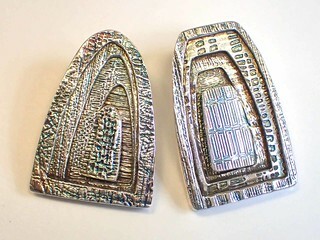 I learned about the concept in her first book, from 2003, Creative Metal Clay Jewelry: techniques, projects, inspiration, and had that reinforced when I earned my PMC Certification in a course with her, in Baltimore in 2007. 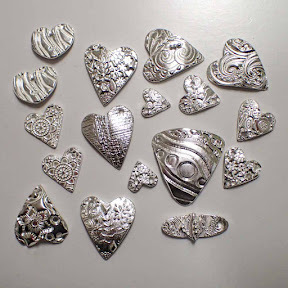 At that point, I’d make a small piece (earrings or small pendants) out of the original PMC Silver formula (no longer available), that had a shrinkage rate of 28% (and had to be fired in a kiln for a full two hours). I’d embellish it with Art Clay Silver, that had a shrinkage rate of 10%. Why those two? Because their shrinkage rates were the farthest apart of all the clays at that time on the market. Because it was constrained by the low-shrinkage clay, the high-shrinkage clay would curve and distort in interesting ways: the fun part was trying different locations for connecting the clays to discover what results I could produce. (This was also back in the day when the nominal price of silver was a mere fraction of what it is today…. I am so glad I started that early! Even then, I did feel limited in how much sheer experimenting I could do, but nothing like it would be today….) I did some other clay combos too, but that particular pairing consistently yielded the most interesting results. The relatively high shrinkage of “original” was the key, no matter what other clay was combined with it. I stopped doing any of that when Mitsubishi discontinued their original formula. Like many others, I was sad to see it go, but I created enough designs in other ways that the loss didn’t feel as devastating to me as it did to some folks. 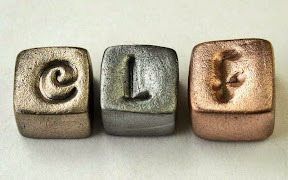 Since then, a few other silver clays have come on the market with shrinkage rates in the range of 20 to 25%, and at times I’d think about reviving that old technique with them, but then would get caught up in other project ideas and that would slide way down on the priority list. 2. I have written here before about how I try to not store “leftover” clay. I just keep making things until I’ve used a packet all up. Some of my earrings are made with leftover bits. Little embellishments can be cut out or coiled up, dried, and used in later creations. The last few dregs can be shaped into little balls, dried, and stored for later use too. If I don’t have time at the end of a work session to use everything up, I will store the last bits for a brief time, but I do try to form those into something useful as soon as I can. And when I fired those two pairs of earrings … the photo below shows what I got! Can you see how far they’ve curved?!! I’m not disappointed in the results. In fact, I’m happily reminded of those early CeCe-inspired domed pieces that were so much fun. It’s just that this is not what I was expecting! The shrinkage rates on these clays are nowhere near as far apart as what I was using in all domed pieces I was making a decade ago — I would have expected this with those. Just not now. I guess this is telling me I need to find some time (where?!!) to do some more experiments! If you’ve experienced anything like this, intentionally or not, please let me know. Take a deep breath and “Don’t Panic!”…. Though it seemed odd to have Stephen Moore, who’d been the voice of Marvin the Paranoid Android in the earlier versions, replaced by another actor, I just melted into my seat when I realized it was Alan Rickman‘s voice I was going to have the opportunity to listen to that evening. So I was thinking about THHGTTG because I’d been thinking about the various times I’d seen / heard / watched Alan Rickman because this was on the day his death was reported. And when I thought I’d lost a student’s piece, I was already primed to quote from THHGTTG, “Don’t Panic (in friendly orange letters)”! Lost a piece?! A student’s piece?!! Let me back up from the start. Late last week I got an email from some folks who’d “found me” online, checked my website and saw I wasn’t promoting any classes in the short term, but wrote me anyway. With a friend coming in for the weekend, they’d been hoping to find an introductory metal clay class. I responded that, though I didn’t have an “official” class scheduled, I could free up a couple hours on Sunday afternoon for a “semi-private / custom” lesson on basic techniques. My schedule was tight enough for the day that we wouldn’t have time to make anything elaborate, but there’d definitely be time for a few basic pendant and/or earring pieces: textured on both sides, cut into interesting shapes, embellished a little bit, domed for drying if they wanted, and finished nicely all over. They’d get a feel for working with the clay and, if they wanted, we could cover something more involved later on. I’m very glad I made the offer: they came on Sunday and were lots of fun to work with! I showed some sample pieces where I’d embellished them with metal clay decorations, but also others where I’d kept the clay-design simple and embellished with beads and wire and such afterwards. It’s always interesting to see different techniques resonating with different people, and that afternoon was no different. Having fit this into my schedule at the last minute, I said I’d fire and tumble the pieces over the next few days, would have them ready at some point, by the next weekend at the latest, and would send a note as soon as they were ready. So far, so good. Now, most of the pieces were domed, so my plan was to fire them in a small crucible and provide some support for their shape by nestling them into fine vermiculite. Between all their pieces plus a few I’d made during demonstrations, the bowl was feeling pretty crowded. I wasn’t worried about pieces being so close they’d fuse. But I was a tiny bit concerned that, because having a lot of metal in a close space can help hold heat in that one area, I might have to drop the temperature and/or speed a bit. I could have just poured vermiculite on the shelf to spread things out, but I had a few scraps of fiber blanket, so I took a couple items out of the crucible and placed them on the kiln shelf with a bit of that for support, and it all seemed better. What I did next is something I learned to do a long time ago: I take a photo of everything on a kiln shelf before I put the shelf into the kiln. I don’t necessarily keep those photos for very long. It’s just that, if I notice anything “odd” when the pieces come out of the kiln, sometimes it’s just useful to be able to go back to the pre-firing photo and double-check what a piece had looked like then. So I fired them one afternoon, did a quick check once the kiln had cooled a little bit, saw that everything looked fine, and headed off to an evening meeting on another of my activities. I came back the next day, prepared to work on something while the pieces tumbled. 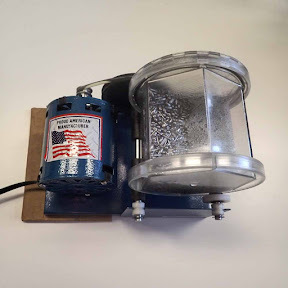 In the workshop, I’d talked a bit about the different results I could get if I tossed them with mixed steel shot in my rotary tumbler for a couple of hours versus if I ran them for 20 minutes or so in my magnetic pin finisher. So I was sitting there, lining up the pieces according to which they’d asked to have treated each way, when I realized that one of the smallest hearts was missing. No panic: I must have just missed taking it out of the bowl. I poured the vermiculite from the crucible into another bowl. No sign of it. Don’t panic! I started looking around my studio. No sign of it. Don’t panic! Because I hadn’t felt like taking time to set up the exhaust system (works fine in the summer; doesn’t have quite a good enough seal for use in cold, wintry weather … another project to finish), I’d just put the kiln on a cart and wheeled it into an unused room to fire the day before. Don’t panic! And I’d moved the pieces around, placing a few with support on the shelf in order that the crucible would have fewer pieces crowded in there, so could I have set it down and just missed putting it back in the kiln? No sign of it in the other room either. Don’t panic! I just kept repeating that to myself. I poured the little bits of vermiculite back and forth yet another time, still no sign of it. Don’t panic! The missing piece was a tiny domed heart. Had it been something I’d made, I would have not had to repeat that mantra as many times: I would just have made another one and found something else to do with the first one if it ever turned up again. But this was not my piece; it had been made by a student. I could offer her some more clay and a chance to remake it. But the missing piece was one by the out-of-town visitor, and apparently she had been the person who’d been most enthusiastic to learn about metal clay and had encouraged a friend in Pittsburgh to find a class they could take together when she’d be here … and this was one of her very first ever pieces. I do remember how attached I felt to my first piece. I had to find this one. Take it easy, Carol. Don’t panic! Just sit there and think. You took a photo before putting anything in the kiln. See if it’s in that photo (the one shown above). Yes! It was there. So … where did it go?!! Hold on a minute. Don’t panic! You did something else, not your usual routine, when you checked the pieces last night. 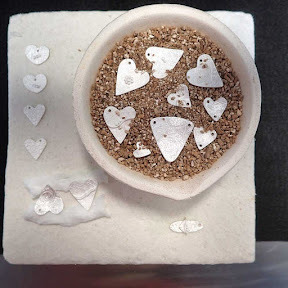 You’d been thinking it would be nice to have a good set of before-and-after photos, to show what “dried clay” looks like going into the kiln and how “just-fired silver” looks more white than silver. You took a photo last night so there really is no reason to panic: just check whether the piece was still there afterwards too. Do my blog readers ever do those “Identify all the differences between these two images” puzzles? (1) One photo of these pieces was taken in the daytime; the other, after dark; so there is a slight change in the overall color tone besides just what is there in the dried- versus just-fired-clay. (2) In the pre-fire case, the shelf is sitting on my metal-top cart; in the post-fire one, I’d put a double layer of black “welder’s cloth” and “kiln posts” on the cart before setting down the then-still-hot kiln shelf. (3) The shrinkage that goes on with the binder-burnout and sintering=phase is visible, which I think is great! (4) But have you, my readers, found the missing piece yet? Is it there, after firing, or not? If it’s not, where could it have gone? I’ll let you think about that for a moment. I’ll answer, and continue the story, in the comments section of this post. I’d love to see some of your comments there, too. Now, Alice is correct. So I could have just “liked” her comment but, well, I admit I don’t know how to be terse, and I thought it was worth trying to be clear about what was going on, for anyone else who might stumble across the discussion here. So I decided that another blog post was in order. Once I’ve got it ready, then I’ll go “like” her comment and share this post too. There’s a brown paper bag folded in thirds and stuck under one end. Why? Well, I don’t think it’s specific to this style of tumbler, though it may be a bit more common with these than with some others. But I discovered this trick with the very first tumbler I ever used: a little, all-plastic, undersized for its intent, rock tumbler for kids. The key is that the barrel has to be in good contact with both rollers, both of which have to be able to turn smoothly. In an ideal setting, the base would be flat on a table. The motor would turn and the belt attached to it would turn the roller in the middle of the base. That would turn the barrel. Because the barrel is also supported by the other roller–the one at the end–that one would turn too. Thus, the motor, belt, both rollers, and the tumbler would all roll around together. Slightly raise the end with the motor on it. This pushes the barrel onto the roller at the “end,” which forces that one to move along with the barrel. Slightly aise the end opposite the motor. This pushes the barrel onto the roller in the “middle,” which reduces the role of the one at the outside end. I’ve tried it both ways and, in fact, both seem to work. But, as shown in my photo, above, I tend to set things up the first way, so the end with the motor is just slightly higher than the other end. In my logic, the second way seems like it’s putting extra pressure on the motor to do all the work. The first way seems to force both rollers to contribute to the effort, and that’s why I prefer to set it up that way. If you have any other suggestions, or a better way to explain what’s going on here, please contribute to the discussion via the comments below! I love my clear plastic hexagonal tumbler barrels! An art-jewelry-friend of mine, Zoe Nelson, posted this in a metal clay group on Facebook last week. But I check Facebook only sporadically, so I didn’t see it until a day and a half later, by which time she’d already received dozens of suggestions and found a neighbor whose car-repair tool (an oil filter wrench) actually helped to solve the problem. Until then though, none … none! … of the suggestions were how I would have responded: a few were halfway-decent alternatives, a few were complaints rather than solutions, some were simply sympathetic notes, and the rest were ideas that were far more complicated than I’d’ve thought necessary, a few even likely to damage the barrel. Thus, this blog post, at last, that Zoe knows I’m writing for her (and any others in a similar predicament!) to have for future reference. 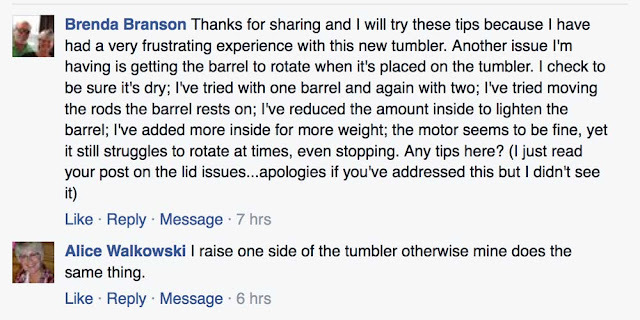 I did make a range comments about my tumbler that uses these barrels, and more, a few years ago. (Looking for the link — gosh, that was way back in 2012!) So I have over three more years experience with it since then. Yeah, the clear plastic lid can be a bit tricky. But (just as Zoe said in her Facebook exchanges with her readers) I’ve had as much trouble, in different ways, with the lid on the kind of barrel that’s made out of black rubber. While your experience may differ, I will take the clear plastic ones any day! You can follow the link above to read the pros and cons I wrote back in 2012 (and see a few more photos, plus other alternatives, if you landed here without a lot of knowledge of tumblers), but here are the things I want to say now that relate specifically to Zoe’s problem and anyone else who may encounter a similar one. After you’ve filled your barrel with shot, water with either a bit of dish soap or burnishing compound, and the pieces you want to tumble, do this: Dip your fingertip in the liquid and run it around the rubber ring that seals between the barrel and the top. You don’t need to soak it, just get it slightly damp. This seems to help it form a good seal. Turn the lid forward to tighten it. It should turn smoothly and freely: if it doesn’t, stop! If you have trouble getting it on, you will have more trouble getting it off! It should tighten easily. If it’s catching, it’s not seated correctly. Back up a step, and repeat that one and this until you get it to close up easily. Then, tighten it a bit more so that it seals. The lid does need to be tight, but not super-tight. Tip the barrel sideways and turn it around a couple of times (like it will turn on the base), and see if it leaks. If it doesn’t leak, proceed to start tumbling. If it continues to fail, don’t over-tighten it! Spin the lid backwards and, if it moves smoothly, go ahead and try to re-tighten it. If it doesn’t move smoothly or still continues to fail, just take it off and start from the first, seal-lubricating step above (checking to see if it may be time to replace that rubber ring). 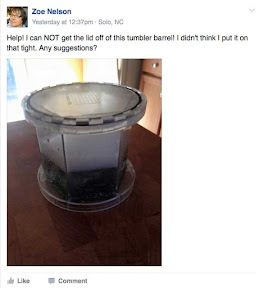 When you’re done tumbling, the lid should come off…. It may take a bit of effort (you did have it sealed up well, you know, so it wouldn’t leak! ), but set it down flat on a table, hold the barrel, and figure out how to push down (to press against that great seal you managed to make) and turn the top, let up and turn if you can, push a bit more if necessary and keep trying to turn, until it starts to move. H. Allen Smith revealed to the world the technique for opening all screw-top containers. Now there are untold millions of us who face Mount Kisco or wherever it is he lives and say thank you every time we are faced with an obstinate top. The technique: Bang the top flatly on a hard surface, like the floor. Not the edge, but the flat surface of the top. Just once. Hard. That’s all. And to think of all those jars we used to hold under hot water. Anyway, there may be a few “bad” clear plastic tumbler barrels out there (and others that have been damaged by mis-use) that are harder to tighten, and those will also be harder to open. But I have two myself: one marked A for the Latin Argentium aka silver (or other precious metal) pieces, and the other, marked B, for pieces containing any form of Base metal. I’ve used a few others at meetings or workshops. I’ve seen people struggle to get them to seal and I’ll admit I struggled with mine the first few times I tried to use them, until I got a feel for it. Like riding a bike (or rolling out metal clay) once you "get" it, it seems easy! And, every time I’ve had a problem closing any of those barrels, I’ve just loosened the lid, spinning it backwards until I’m sure I’ve got it seated right, and closed it back up with little difficulty. If I tighten it just enough to get a seal (and even that does take a bit of practice to get the feel, but it will come if one remains calm and pays attention), it may take a bit of oomph to get it to start to open, but it will come loose again. Or, if it does resist, just use the tip above: lid down, flat, once, hard. Because we do need to be able to retrieve our beauties once they’ve completed their tumble-burnishing, don’t we?!! Because of the raw copper underneath, these are bound to come out a bit darker than many of the ornaments, but I still think they make cute little casual holiday treats. I don’t normally like to coat my metal pieces, but I did put a waterproof acrylic coating over the colored side of each piece. I still wouldn’t recommend wearing them while you swim or otherwise expose them to any chemicals but they should hold up under normal use beyond that. I could make more of those, or just make singles and hang them as pendants … if there seems to be interest. Time will tell! Still, I’m happy to fulfill custom order requests: I do have all the stuff to make more and would be happy to keep going until I’ve used that up, should anyone want more once these are gone! 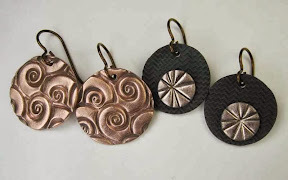 Oh, and both kinds of earrings are offered on hypoallergenic niobium earwires that have been anodized to the nice dark-copper-brown color shown here. 2015’s Crazy-busy Season Is Here! You’d think I’d know better by now … taking on a whole new project right before crazy-busy-sales season! But why not make something new and fun to help celebrate the season? Then I happened to go to a local (regional) crafts store (Pat Catan’s) just to get a roll of vinyl for a little home decor project I wanted to make as a gift for a friend. Worst part of the story is that they didn’t even have the one I wanted in stock just then. Now, I could well have ordered it from somewhere else online: but I only thought of doing this at the last minute (ha! ha!) and I wanted the vinyl in order to make the gift that day…. So I strolled around a bit looking for something else I could make that afternoon (I needed to deliver it at lunch-time the next day, you see), and there they were: clear glass ornaments just calling out to be decorated! Of course, I bought one box (just one!). Again, of course, I picked up a few other little supplies, added those to some I had on hand already, and had a great time decorating. The next day I gave several to the friend and, on my way home, stopped at a different Pat Catan’s to look over the entire selection, walking out with several boxes each of seven (7!) different size / finish / shape combinations and a months-long project ahead of me. 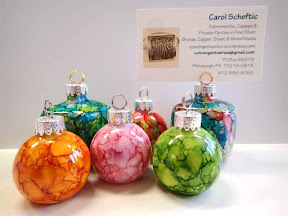 Though five of the shape-size combos are fairly traditional for ornaments, two have flat bottoms so that, while you can hang them on a Christmas tree, you could instead just set them on a flat surface. The round ones even came with a double-loop around the top so that, if you did set them on a table, you could insert some sort of card in between the loops: a photo, a note, a place-card at the dining table (that your guests could then take home as gifts, perhaps! ), etc. I looked at how those were made, and ended up making my own double-loop tops to use on the square ornaments in place of the standard (single-loop) ones they came with. Then I had a grand time coloring them, most of them both inside and out. I made that style just because I like them the most that way … so if they don’t all sell I can still be happy about using the rest of them myself! To be sure, I will still have lots of jewelry available too! I’ll talk about where everything will be available in an upcoming post! Mostly, this will be pendants and earrings in silver and bronze. I’ll have a few pieces in other styles and / or metals, but those are my favorites to work in (at different times, somewhat just depending on my mood because they are different in subtle but important ways). With daylight hours getting shorter and shorter this time of year, I’m glad to have all these various bits of brightness around me, made of glass and metal and love. I hope they’ll soon find new homes and help brighten up the lives of others too. Lately it seems that all I’ve managed to post about are shows, not the creative process. I do love shows, parties, festivals, and more. I want people to see my creations, those are great ways to enable that, and talking about those is generally considered to be a way to help in finding an audience for my works. But I also enjoy sharing information about the processes involved in my artwork so I’m going to try to slip in one of those posts today. I’ll discuss a technique I use at times that I only just realized I haven’t written about here: using a little electronic die-cutting machine on my metal clays. As far as I know, Wanaree Tanner is the one who got the ball rolling on using these with metal clays, traveling around doing workshops and promoting the use of the Silhouette Cameo several years ago. It seemed to me that the thing she promoted most was using them to create your own elaborate bezels for setting stones. She doesn’t seem to be making such a big deal about the Silhouettes any more (though anyone who follows her work can see where she’s still using hers). I can appreciate the way she simplifies the making of such bezels with that tool; it’s just not a style I want to emulate all that much myself. Cindy Pope seems to be the person now leading the charge with Silhouettes and metal clays, making layered designs, etching words and patterns along various shapes, and doing all sort of things I find much more up my alley, design-wise. (Cindy was also a great house-mate in CA and then host in OR the last time I went out to the west coast!) The photos with this post will illustrate one of the very simplest applications of these cutters. Several years ago, I bought a Silhouette Cameo. I used it a few times with metal clays, enjoyed the results, but still found my own designs mostly going in other directions. But I do use that device at home for all sorts of useful little paper-crafting tasks which is really what that machine was designed for. Of course, not long after I bought my Cameo, Silhouette America came out with a new machine, called a Portrait (more compact than the Cameo), and then a newer version of the Cameo (with a touch screen instead of the buttons that both the Portrait and my older Cameo have)! I guess those are why the one I got was available at a really good price at that moment in time! But that’s fine, because they all use the same software, and attachments, and so on. So there I was one day a few weeks ago, with a brand new tube of “One Fire Brilliant Bronze” clay powder. This was the only one of Hadar’s basic “One Fire” clays I’d not yet tried. I wasn’t feeling stuck or anything, I was just looking for something simple to make to try out this new-to-me clay. I had fought a bit with the older Quick Fire Brilliant Bronze: I did like the bright golden color; my problem was that I kept facing challenges with the “bottom side” of textured, reversible pieces I’d made with it. 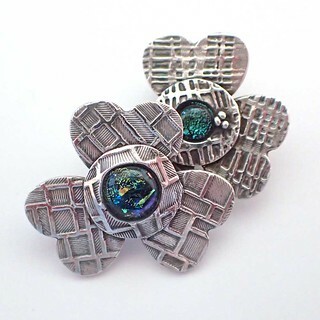 (And regular readers of this blog will know that textured, reversible pieces make up the majority of my creations!) The thing is, with pieces cut on the Silhouettes, you really want one side of the piece to be flat: that helps it to stick better to the cutting mat! So, I thought, if I’m ever going to try this One Fire Brilliant Bronze, using it for plain-backed Sili-cut pieces seems to be the way to go. So, I mixed up a batch, took a part of that and added a bit of glycerin (which gives the dried clay a tiny bit of flexibility, which is extremely useful as you’re separating your just-cut pieces from the cutting mat!). Then I rolled out a few small pieces with light- to moderate-depth textures on one side only, and set those aside to dry while I sketched a few sample designs. Not imagining I’d have any reason to write about it, I didn’t stop to take any photos. I loaded the clay pieces onto the cutting mat of my Portrait, and cut away. The cutting was the easy part! As always with a new-to-me clay, I did NOT fill up the kiln for my first firing. I started small, taking just one pendant and two smaller, matching pieces (an earring-pair) and fired those. Massive fail: bubbles and cracks: overfired by a lot! I took another earring pair, dropped the temperature, and tried again. Overfired again but, OK, not quite as much. Another pair, dropped the temp a good bit more, tried yet again. Still a bit bubbly, meaning they were still overfired. To drop any lower, though, I’d be going well below the recommended temperature for that clay, so I went online and asked Hadar herself for some advice. She said the firing range for that clay was actually rather large, she often fired at a temperature close to where I had ended up. Since I know my kiln does actually fire a bit hotter than where I’ve set it, it only took me two more tries before I got things to work out the way I wanted! But, while waiting for Hadar to reply, I fell into one of those pits where I couldn’t think of anything else to create. So …. I mixed up some .960 clay, and rolled out a number of small, thin sheets of that with textures on just one side. To keep things simple (since I was just trying to perk myself up during a brief lull! 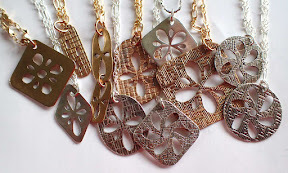 ), I used the same sketches as I had for the bronze, cut out nine (9) silver pendants and six (6) pairs of earrings (shown in the first photo in this post), cleaned them up a little bit as needed, and fired them right away. When I finally got a Brilliant Bronze piece to fire successfully, I took a photo of it. I then fired all the remaining Brilliant Bronze pieces I had waiting and, when those came out fine too, I polished everything up and took a photo. Well, this isn’t quite everything: it’s just pendants (not any of the earrings) and only the ones for which I had enough chain! I’ll have to get some more for that, and finish off the rest. But I am feeling a great sense of accomplishment! Silhouette America had at least one model before the Cameo, which I think was called an SD (for Silhouette Design, I would think), and they’re about to come out with yet another newer one, the curio (yes, they use lower case for it). The bed of curio will be even smaller than the Portrait, but it will be able to cut thicker materials, meaning thicker layers (less fragile after firing) of metal clay! (Though the Silhouettes are all at the low end of cutting-force compared to other electronic die-cutters, so the curio will still be limited by that with regard to some other materials.) Still, though I’d love to have that option, I need to sell a lot more pieces before I spring for yet another machine… I don’t see the curio replacing my Cameo but, if I were just starting out now, I’d get it instead of the Portrait. Still, having all three could be useful for workshops next year…?! I’ve fired a few more loads in the two weeks since the adventures reported above and, at the same temperature (even just a tad lower with the last, very-full load); all have turned out fine! I’ve heard / read about some people who say they don’t like Hadar’s clays because they seem so fussy. My personal experience is that each new one does seem to have its own personality, what it’s like to work with and to fire, but once you find its sweet spot, it’s then at least as reliable as any of the others on the market. Regardless of whose clay I’m using, the scientist / engineer in me is fine with starting off slow, observing what happens, building my understanding, and then taking off! The next time I go on a real Sili-binge, with much more elaborate constructions, I’ll try to remember to illustrate those here too, eventually. It really is a fun little tool! Well, actually, the photo does show two curious bits … if you’re counting both pieces that make up one pair of earrings. But it was just one quick little experiment. For some time now, I’d been curious about the “Magical Silver Plating Paste” that, I forget when, I had noticed on Val Lewis’ website. So, after I’d earned a little bit of extra money earlier this month (Thanks, Deb! ), I ordered myself a little jar of it to try out. Now, I will admit to being surprised when I read, in various online forums, about someone having bought some new product who spent hours if not days trying to create some masterpiece with it straight off, and then feels devastated when something goes wrong. Often, something that any experienced person would have known from the start would have gone wrong… Now, I will admit that I’ve had a few big-time failures with things I really thought should have worked, but not many. I tend to start small, first time out, and then work up to bigger stuff, even if something big is the reason I want to head down that path. So, when the paste arrived, I did not immediately go off trying to plate something big and intricate. Instead, I dug around in the nooks and crannies of the cabinet in my studio where I stash leftover bits and pieces. I found two little disks I’d made months ago out of Champagne Bronze. They were made during a push to produce a lot of earring in a short bit of time. I’d used up all the anodized niobium earwires I had on hand that day, and just stashed a few remaining “elements” in the cabinet to use in the future, once I’d made or obtained more of the wires. And, even though I’ve not yet gotten around to replenishing the stash of dark earwires (that I tend to use with bronze), I thought, “Hey, if I plated these, I could use a couple of the sterling earwires I still have in the drawer.” A little later on I came to realize that this design had an interesting mix of two different textures on it: I could try plating just one part and leaving the other in its natural color, so I could then compare how things looked from the start and how the different parts held up over time. The instructions for the paste say to just apply it with your fingertip, but that the product can stain your skin so it’s best to wear rubber gloves. First time out, I do tend to follow instructions, so that’s what I did. And there I was, holding each of these little (barely 10 mm) disks in the rubber-gloved fingers of one hand while trying to apply the paste with a rubber-gloved index finger of the other one. Oh, and not to the whole piece, just to the bottom half of one side, a decision I made only after I’d begun applying the stuff to the first piece! So, please understand: any “imperfections” in the coverage are entirely due to operator-error first time out. In the future, if I decide I want to plate part of a piece, up to a very specific point, I’ll spend a bit of time before I start thinking how best to achieve that. For a brief, initial trial, however, I am pleased with this result, with a sort of gradual shift from dark yellow bronze to a sort of silvery bronze to a deeper silver. As to the process, the application was easy! I scooped just one tiny “drop” of the stuff out of the jar, and achieved this coverage on both pieces. It did take about three passes to get what looked like good coverage. I wasn’t at first sure what I was getting, because the stuff looks a dull gray as it goes on. Since my fingertip was a tad moist (per instructions) as I applied it, I waited briefly for some drying to occur. Then I buffed it a bit, decided to add a few grains more to one edge, buffed again, and decided that was fine for now. Again, as instructed, I then gave it a good wash, dry, and polish, before taking this photo. I have some ideas for more complex copper and/or bronze pieces that I’ve been wanting to make, but have not tried yet because I wasn’t sure that they could bring in enough revenue to justify the time involved in making them. That’s the thing about working in base metals: the materials cost less so customers (understandably!) 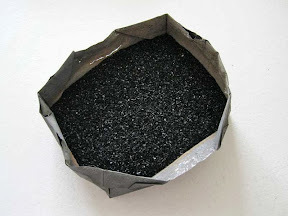 think they should be priced significantly lower than precious metals, while artists (also understandably…) know it typically takes as much, and sometimes more, time to make a piece out of those materials. My thought in buying this stuff was that being able to promote them as having at least select portions silver-plated might help justify in customers’ minds a more appropriate price, while not adding too much additonal time at my end. I’ll do a few more experiments on simple, little elements like these and, if I continue to see success with this approach, then I’ll move on to the more complex designs. Whatever the final outcome, I’m sure I’ll have fun experimenting! While I was making the little domed disks I used for the charms I mentioned in my last post, I had another small project going, an item I’d made ages ago and had for some time been wanting to make more of: Buttons! 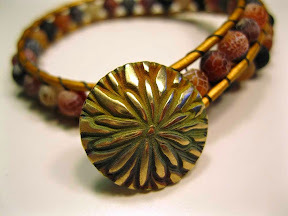 And then, my colleagues in the Western PA Metal Clay guild decided that our project / activity for our January 2015 meeting would be to make bracelets in the style popularized by Chan Luu, where the closing on her signature pieces involves a hand-made button. So now I had the push I needed to return to button-making. Except our January meeting was cancelled due to weather issues, and the project was pushed forward into the February meeting. I didn’t want to show button pictures until we’d done the guild-project, so I put off posting about it. And then I got bogged down in snow-shoveling, ice-chipping, pothole-damage to the car, etc., until tonight, at last, I found a few minutes to take a few photos to share here. First (above) is a photo of eight different buttons: three were made from Hadar’s Quick Fire Bronze and five, from her Rose Bronze. Second (left) is a photo of the bracelet I made during the guild meeting … for which all in attendance offer thanks to our leader-for-the-day, Sharon Shepard! 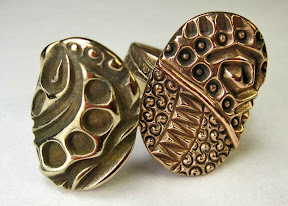 That one includes yet another of my Quick Fire Bronze buttons. Third, not shown yet, are the backs of any of the buttons. Regular readers of this blog will know that I usually show both sides of the pieces I make. In large part, that’s because I tend to make pieces that are fully reversible. But buttons may or may not be used in ways that are readily reversible. So I made some shank-style buttons (all the ones shown here feature shank-backs) and some other two-hole ones. I hope to write more about all of them eventually. But I’m not doing that yet: (A) Part of the button-making involved trying out a handful of different techniques for actually making shanks. While I do know enough to be successful at that, in general, my exploration-goals were to (1) examine how easy/difficult the different ways might be and (2) to be able to test whether any particular approaches held up more/less well after longer-term use. And (B) I’m testing them by further by producing samples of ways to use them well beyond just the Chan Luu bracelets, which also takes time to work out. Why am I going to all that “trouble” when all I needed was one button for one bracelet at one guild meeting? Because the reason I’ve been wanting to spend a few weeks making buttons, and then several months (or more!) testing them out, is because for a long time I’ve been thinking I should put together a button-making workshop! There are just soooo many great ways to use buttons and button-shaped elements. I’m looking forward to creating a variety of pieces to incorporate those, myself, and to the further inspiration I’ll get from students when I offer the class. I’ll post places, dates, and times here (and elsewhere) once I am satisfied that I’ve done enough testing. After I’ve taught it (once or a few times) then I’ll be more inclined to come back write more about it here. Please stay tuned…! Let me be clear from the start: I think that “weaving” metal clay is loads of fun, and it produces interesting results. Great combo, eh? I don’t have any decent pictures from when I first started trying to weave metal clay. I don’t even have any of the earrings I made by weaving strings of PMC+ (on my own) or strips of PMC+ sheet (when I took a RioRewards certification class with CeCe Wire, down in Baltimore). Both ways, I had fun doming the results by backing that with the now-discontinued, sigh, high-shrinkage PMC Standard clay. 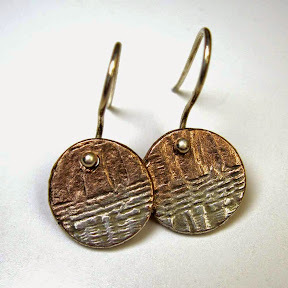 But here’s a pair of the latter that I made in 2010 (yeah, well, I redid the Rio Rewards when Tim McCreight taught it a few miles from my house); this photo is from when I used them as one of my entries in Vickie Hallmark’s Month of Earrings Challenge that year. While I enjoyed doing this, and I did play around with other weave-spacings, I found that the sheet product had two drawbacks. First of all, you have to be very careful attaching sheet to a backing or frame: not enough water and it doesn’t stick, but too much and you’ve ruined it. Second, another thing I love about metal clay includes the design possibilities with textures, and sheet does not take textures the same way. Early in 2008, not long after Hadar Jacobson’s first book (The Handbook of Metal Clay: Textures & Forms) had come out, I was thrilled to read about how to doctor-up my own clay so that I could texture it but it would still remain flexible, like the sheet product, in the greenware state. Here are several of the first pieces I made with that clay, photographed together to use in promoting the first workshop I taught using this approach. Though my workshops for beginners emphasized making woven pieces that were still essentially flat, on my own I went on to explore a number of other designs. Magic Carpet (or, to those with some knowledge of non-Euclidean geometry, Weaving through Hyperbolic Space), shown below, is one of my favorites from that period. So when I first got my hands on PMC Flex, one of the things I thought to try with it was another woven piece. Yes, I knew I could also explore other styles entirely, and that’s coming. But, first time with a new clay, my inclination is to do something that is already deeply seated in my “finger memory”! Something that I know I can make successfully some other way, such that the question is how this particular clay performs in that approach. So, at last, here’s something of a step-by-step on weaving PMC Flex. I began by rolling out a few strings (aka rods, snakes, etc.) of PMC Flex. I also textured a few small sheets of clay; after neatly trimming two edges, I returned the extra clay to the package. Once the sheets were dry, I cut them with a pair of plain scissors. For what it’s worth, I’ve been known to cut moist regular clay the same way, with plain scissors and with fancy-edge crafting scissors. By waiting until your clay has dried to cut it, you remove the risk that you’ll smush the piece, leave unwanted finger- or tool-marks, or stretch the pattern. And, yes, I’ve been known to cut dry regular clay, but there is some risk of breakage doing that. Dried flex clay just cuts beautifully, with ease. My last question for the evening was how well this little woven sample would fit my cut-out washers. There’s no reason one has to get it to fit as well as shown below, though that is a pretty good fit if I do say so myself! The point is that the strips need to be long enough; later on, you can always trim off any pieces that are too long. And here’s the thing about that sanding. With diy-flex, I would almost always make the washer / frame shape out of regular (non-flex) clay. Why? Because the diy-flex clay (especially the extra-bendy stuff I could make from PMC+) was challenging to sand. It was so flexible, it just bent away from my sandpaper. I’ve read about heating this new PMC Flex clay to harden it up so that you could sand it. Had that really been necessary, in this instance, it would have made sense to just make the frames out of non-flex clay. But, given the success I’d had with smoothing the sharp-ish edges on the Möbius-strip earrings I’d tried first, I decided to make one frame out of flex clay to see whether or not I could sand smooth its inner edge. As you can see from the images above (especially if you click to enlarge them), I was able to smooth both pieces out nicely. I did hold them both carefully as I did so: the PMC 3 so I would not risk cracking it, and the PMC Flex so it would remain straight-up under my sandpaper. But I did not have to heat the Flex to accomplish this, which really did please me. Next, I put the rigid PMC3 frame back onto the light bulb on which I’d dried it. (That’s why I’d made that one out of the non-flex clay: there is no reason at this point to have it move at all.) I carefully placed my woven swatch over that, shifting it around a bit until I was happy with its position. Then I took a dab of water, and attached each strip-end to the frame. And then, well, I really thought I’d taken photos of the next few steps too, but now I can’t find them. I put a few little end-trimmings in the bigger gaps around the frame to serve as supports. Then I moistened the strip-ends and the other frame element, and squidged all that together. Finally, I took a little bit of moist PMC3 and filled in all the gaps around the outer edges. (I could have used the Flex for that but, again, I was conserving my first batch of it.) Once that was all neat and smooth, I waited until I was sure it was dry. Then I fired it, sitting on top of a little pile of vermiculite to offer a bit of support. After firing, I polished it a bit, and added a liver of sulphur patina, before adding a jump ring from which to hang it. My last comment here is that using the frame-ring made out of PMC Flex for the second side was a bit of an experiment. I wasn’t sure if the flex-aspect would help, or cause problems, in that step. In the end, I think it’s a bit of six-of-one, half-dozen-of-the-other. Its flexibility let me wiggle it around a bit to line everything up nicely; its flexibility also let one little segment end up a tad out of alignment. My current thinking about future pieces is that, with simple frames like this, I’ll probably go back to making both sides out of non-flex clay. For less-precise shapes, making it possible for the second side to be “flexed” to match the first (but out of a clay that can still be sanded as needed for clean edges) could be a real advantage. Your comments on this are welcome! A second second-report on the new “PMC Flex” clay. In other words, this is merely a follow-up to my earlier “second report” on PMC Flex (which I thought I’d posted earlier but just noticed I had not…) I’ll use subsequent “numbers” on later projects. I really am working on some other designs using PMC Flex, but must-do-now tasks keep interrupting my explorations, and then I get inspired to try something else, and I end up having lots in-the-works but not yet finished and ready for reporting. As usual! But my earlier post had stopped before I’d gotten through the entire process with even my first little pair of earring elements. They are now finished, so I’ll at least take the time to finish their documentation too. Anyway, long before I saw that, I’d already fired my first two little pieces by just placing the still-flexible greenware flat and unsupported on my kiln shelf. Now, to be honest, I had thought I might place them on some vermiculite in a little silica crucible I have. Except, I’d just taught a morning-only workshop where students made at total of 19 pieces (using PMC3 and PMC Plus that had been ordered well before the Flex was released). I had to get those pieces fired and returned to the participants. With this particular group I was not going to have a follow-up finishing session, where I could show them how to re-shape any that had “shifted” during firing. 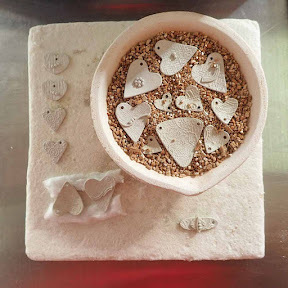 Though many were ones I could place flat on my kiln shelf, there were enough that had gentle curves I wanted to support, so I squeezed all of those into the vermiculite. Since I didn’t want to wait to fire my two little earring pieces, flat on the shelf they went too (as shown in the second photo with this post). And I think they came out fine! I added a small glass bead to each for a touch of color, and hung them on ball-end sterling earwires. I’m calling the “Almost Möbius #1” (the number because, though I’m sure I’ll never make another pair exactly like this, I can imagine myself playing around some more with the Möbius-band idea). A second little report on the new “PMC Flex” clay. I’ve got several other high-priority things going on right now, but I just can’t resist sneaking a few moments here and there to play with this new toy! There’s nothing wrong with clay that does that! I just note it here, in case you’re wondering why this happened to your clay. It’s normal! 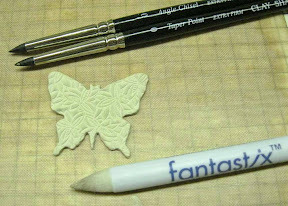 My plan had been to cut a matching shape out of the interior of this butterfly, using a paper-punch I have. Except, it seems I had not marked that punch (for my own short-memory benefit) before I made this piece, and only at this stage did I realize it was one of my “thinner” ones … meaning this piece was one-card too thick to fit into the punch. Oh well, I’ll deal with cutting it, a different way, later on. For now, let’s just look at another little play-thing. If you watch the video, you’ll see them make it look so easy! And I’m here to tell you their secrets: First of all, you can see the “cut” in the video stream where they left out a bit of the fussing needed to make it work (it IS possible, even with diy-flex clay) but, even more important, their band is perfectly smooth. That makes it much easier to get the join to work, because you can fuss and fill and sand it all smooth again. But I like textures, and I don’t like sanding. It’s not like it wasn’t going to work at all, but I soon realized (soon … after a twist, some water, some squidging together, some tape to hold it for a while, etc.) that it was not going to be quick and simple. I’ll work on that idea a bit more but, in the meantime, I moved on to test-plan-b for these strips. Now, I could have gotten that shape with non-flex clay. But I would have had to do everything while the clay was wet. Or, more accurately, while it was starting to dry out, which can sometimes be a problem for me (especially when trying to make two matching pieces) and is far more often an issue with students when it all starts to crack. So, in that sense, the PMC Flex does make this project now far easier to do in a beginner class. And, doing it this way, I could still try using a paper punch! Not one of the fancy crafting punches, as I’d planned with the butterfly, but with a plain, small hole punch. Yeah, I could have drilled a little hole with a drill bit, but this turned out to be way more fun, once I’d gotten over the surprise! The thing is, if you look at the piece lying along the bottom of the photo above, you’ll see that both it and its mate (though harder to see in the punch) have a very straight, sharp edge along what will be the top end when hung. I didn’t want that sharp edge with the rest of these curves. Had I planned to do this from the start, I would have smoothed all those corners while it was still wet. But now I had dried, attached, and punched clay, and I needed to soften its edge. With non-flex clay, I’d either wet and smooth it (as I discussed earlier in this post) or I’d take out a bit of sandpaper and smooth it down (I may try to avoid sanding when I can; but I have no qualms about doing it in situations where it really is most appropriate…). With diy-flex clay, however, I always found that sanding was pretty difficult. Actually, the fact that I really enjoyed working with diy-flex is what first led me to figure out all sorts of sanding-alternatives! Once I started using them, I just let them spread over into my non-flexible greenware too, thus replacing much of the sanding I’d earlier been taught. I didn’t change it a lot, but I did round out the corners as I’d wanted, while it is all still flexible. That’s all I have time for tonight. I’ve also started on a woven-silver piece that I hope to report on next. I’m teaching a fine-silver workshop this week (non-flex: had to have that clay on hand before the PMC Flex was actually shipping, but I’ll show of the Flex a bit since I have that first trial batch), and I will report on firing this clay once all the student pieces have been fired. Happy New Year! I can’t believe it’s time to write my fifth New Year’s Day post. A while ago, I wrote a piece where I said that sometimes I compare beading to framing. That is, some 2-d artists offer a mix, where some pieces are “basic” ones and others have been “framed.” So the buyer has a choice: they can take the piece home and hang it plainly, or they can add their own framing. Or they can buy an already-framed piece. 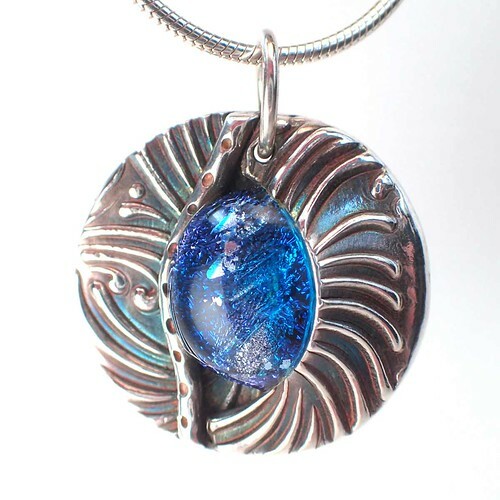 And I tend to offer pendants, for example, where most of them are on a plain cord so you can wear them but let the unique, hand-crafted piece itself be the focus, or you can take it home and add your own fancier chain or even string it with some beads you have. Or I have a few that I do hang in other ways, so that is an option for people who prefer that. I got to thinking about that again, in a slightly different way, the past few weeks. ‘Tis the season for wrapping and unwrapping gifts, and for wrapping up one year and unwrapping the next. With this post are photos of a small sample of pieces I made in the process of wrapping up 2013, as I prepare to offer them in opening up 2014 … as objects of art themselves at first and, until they find new homes, as samples for a new workshop series that’s under development. For some reason, these three told me they didn’t want to be hung simply but, instead, preferred to be wrapped up with ribbons or other forms of decoration. The “sometimes I compare beading to wrapping” analogy hit me as I hung the first piece illustrating this post (above) a hollow bronze “box” accented with copper, rose bronze, and yellow bronze. I just felt it needed to go on the collection of ribbons shown in the photo. (And the inset confirms that, yes, I’m still making reversible pieces.) With all the gift-wrapping that goes on this time of year, I felt that those ribbons wrapped up the “box” in a way that still kept the focus on the special bronze element. You could choose to take it home and hang it some other way, if you wanted, but it’s nicely wrapped just as it is. With the second piece (left) as I made the hollow “draped” pendant, I just knew it was one of the pieces that I’d want to hang some other way, so I made a toggle clasp to match it. Then I hung the main bead on a piece of bronze wire, with some tiger eye beads that seemed to go with its coloring, plus a few spacer beads (mostly to protect the tiger eyes from the ends of the wire wraps), and then used some brass chain between all that and the clasp. With the third piece, a hollow bead then “wrapped” in several different textured layers, I went even further. 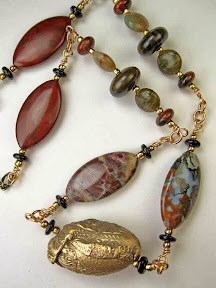 This time I added jasper, petrified wood, and garnet beads, linked together with bronze wire, plus a bit of brass chain (not shown here) near the lobster clasp I used as a closure. Three different ways of “wrapping” a piece up in a somewhat decorative fashion. I hope those who wear these pieces (or even just view their photos) will appreciate the original bronze “focal” beads as well as the way each one has been wrapped up for them to wear. As to the workshops, I hope to have that schedule posted (at least in draft form) within a week. In the meantime though, I still have a bit more New Year celebrating to do. Here’s wishing you a happy and productive 2014!